Lance Cpl. Eric Zauner and his wife, Jill, found a secluded spot to kiss yesterday at the Marine Corps Base Hawaii in Kaneohe. About 300 Marines and sailors with the 1st Battalion, 3rd Marine Regiment and 1st Battalion, 12th Marine Regiment returned from a seven-month deployment in Iraq. 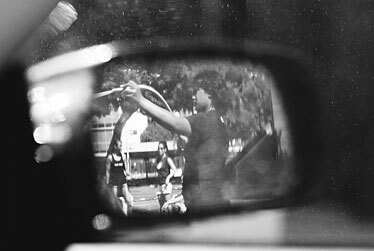 Reflected in a side mirror, Washington Middle School sixth-grader Joanne Tumanuvao was on hose patrol yesterday in the school parking lot during a benefit car wash for the school's sixth-graders, who were earning money for a trip to Camp Erdman.